Chrichton's World: Review Nine Lives (2016): Kevin Spacey as cat is hilarious! Review Nine Lives (2016): Kevin Spacey as cat is hilarious! Cats are magnificent creatures and you either appreciate that or you don't. I have a suspicion the hate towards this movie comes from people who despise cats or simply are too cynical that they can't enjoy some goofy antics featuring Kevin Spacey as cat. 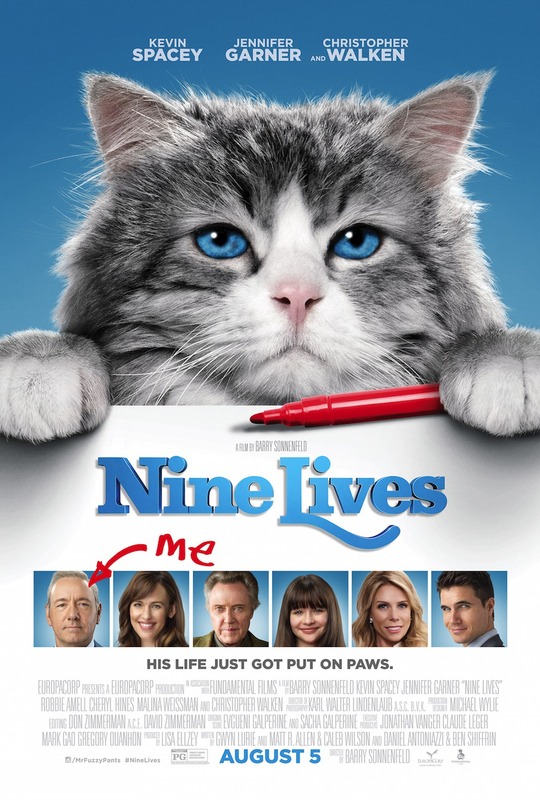 Of course Nine Lives doesn't cover new ground or does something original. It's pretty much what you expect. Kevin Spacey plays Tom Brand a businessman who has lost sight of what is truly important. But thank god for Christopher Walken to teach him a valuable lesson. How does he do this? Well, he changes Kevin Spacey into an adorable fluffy cat so that Tom gets in touch with his family and sees for himself what he has been missing out on. Now, the premise could have been real cheesy and yes maybe some events are silly and cartoonish. Yet I found myself laughing hard and quite a lot since the way cat Spacey comes to term with his predicament is truly hilarious. There are moments where I felt that they should have moved the plot along then again how can you get enough of a cute cat acting out? I don't care if the cat is made from CGI. I hardly noticed it and even if at times it was obvious I could overlook that fact since I was having fun. Spacey as cat did on his own what used to take two. Anyone remember Tom and Jerry? So yes there is a big emphasis on physical comedy. But next to it the film does take time to be a little serious. Perhaps a little preachy. Then again if you would be watching this at Christmas I can guarantee you that you will be sobbing. Making this one hell of a Christmas movie. So do give this a shot people. It's only 87 minutes and you will have fun watching it. Isn't that what movies should be most of the time? BTW. Lil Bub has a cameo in this film.